Based on the performance in 1st Stage CBT, 2nd Stage CBT and/or Aptitude Test (wherever applicable) conducted during 28.03.2016 to 05.05.2016, 17.01.2017 to 19.01.2017 & on 30.06.2017 respectively, followed by verification of documents and genuineness of candidature conducted during 28.08.2017 to 01.09.2017 and 2nd & final call for DV on 19.09.2017 by Railway Recruitment Board, Muzaffarpur against CEN-03/2015, the following candidates whose Roll Nos. are given below in ascending order horizontally (not in order of merit) are provisionally empanelled. 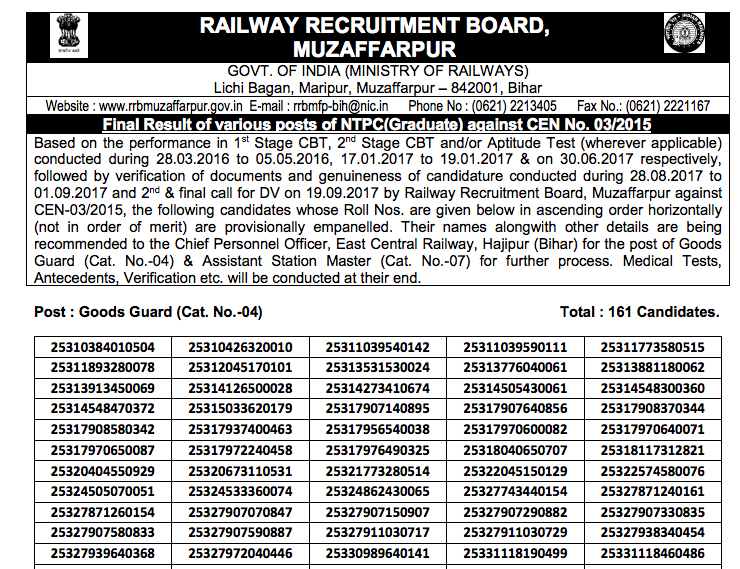 Their names alongwith other details are being recommended to the Chief Personnel Officer, East Central Railway, Hajipur (Bihar) for the post of Goods Guard (Cat. No.-04) & Assistant Station Master (Cat. No.-07) for further process. Medical Tests, Antecedents, Verification etc. will be conducted at their end.